Somewhere, in the not so distant past, I discovered quinoa (pronounced keen-wah). It was identified somewhere as a superfood. Superfood?! …but for good reason. Quinoa is by nature a seed, although it is cooked like a grain. Like grains, it is a good source of complex carbohydrates. However, it has a greater protein content than most grains, and unlike other grains, contains all the amino acids needed by us humans to build protein. Most actual grains usually lack one or two of these amino acids. Quinoa also contains useful amounts of manganese, magnesium, potassium, calcium, iron and phosphorous as well as B vitamins and small amounts of the essential fats. The fibre in quinoa makes it useful for keeping intestines clean and preventing cardiovascular disease. Quinoa has a real nutty texture, and can also be quite creamy which makes it versatile; it can be used in savoury and sweet dishes equally well and is easy to cook. 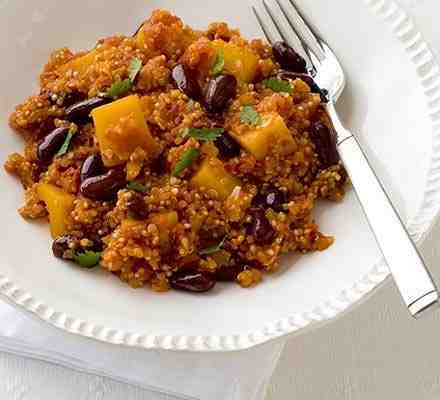 There are LOTS of recipes out there that use quinoa, but this is currently my favourite go to recipe from BBC Good Food for a tasty, quick, and low fat dinner option. Cook the onion and garlic in 1 tbsp olive oil until soft (about 7 minutes). Add the chilli powder, cook for a minute then add the squash, quinoa and tomatoes. Simmer for 10-15 minutes until the squash and quinoa are tender and the sauce has thickened. Add the beans and heat through. Stir in the coriander and serve in bowls. This recipe really couldn’t be simpler! It’s great for vegetarians, and even though I do eat meat, I don’t miss it when I have this!